This smashing work will change the way you think of the relationship between the state and business. This extremely important study by Butler Shaffer—professor of law and economist—will change the way you think of the relationship between the state and business. 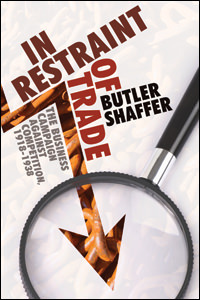 It makes a deep inquiry into the attitudes of business leaders toward competition during the years 1918 through 1938 to see how those attitudes were translated into proposals for controlling competition, through political machinery under the direction of trade associations. What he finds is a business sector not only hostile to free markets but aggressively in favor of restrictions that would protect their interests. This, he finds, is the very source of the origins and development of the regulatory state. The author chooses this period because it was a time when the entire relationship between American business and the federal government underwent dramatic upheaval. It was in this time that business forged a consensus about the scope and intensity of competition behavior that they would tolerate. This began to exhibit a disposition favoring collectivist authority over one another via government-backed enforcement agencies. Free and unrestrained competition required more of them than they were willing to tolerate. It required constant innovation, a fight against falling prices, a continued effort to seek out new markets, and the willingness to subject their bottom line to consumer preferences for lower prices and better products. They saw the vibrancy of free enterprise as a threat to their firms and well being, so they used anti-business sentiment in politics to hamper the market in ways that would benefit them. Shaffer's analysis goes much farther and much more sound than any yet published, partly because he has done such detailed research but also because he speaks with deep understanding of market principles. He covers the change in ideology that took place. He examines all the trade associations and their codes of ethics as foreshadowing government regulatory efforts. His analysis of the New Deal confirms what John Flynn wrote, that the New Deal was not so much anti-business as pro-established business. His detail is especially impressive in dealing with the steel cartel and the natural-resource monopolies. If you ever thought that the struggle for free enterprise was about business versus government, this study, which is written in exciting prose and beautiful English, will change the way you understand the essential struggle. The evidence is vast that big business cooperated closely with big government in building the essential architecture of the mixed economy. What Shaffer has uncovered represents a serious challenge to both left-wing perceptions and right-wing caricatures. It also underscores the extent to which the true spirit of free enterprise must insist on a principled attachment to liberty and not merely promote one sector or interest group over another. This book should enter into the canon of required economic history. Very disappointing. Written in an academic style in the worst sense. Rather than proving his points with solid logic and liberal examples and quotes, he backs up his claims with similar claims from other known experts. I'm sure he's right in some of his claims, but you wouldn't know it from reading his book since he doesn't actually prove his claims. Also, strangely obsessed with modern faddish mathematics (chaos theory etc. ).